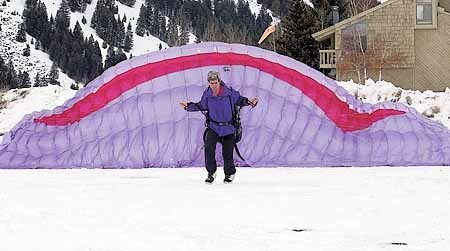 U.S. Sen. John Kerry, D-Mass., practices launching a paraglider Sunday in the upper River Run Lodge parking lot. Kerry, a longtime sailplane pilot, was getting basic ground handling instructions from Chuck Smith, owner of Fly Sun Valley. Express photo by Willy Cook.